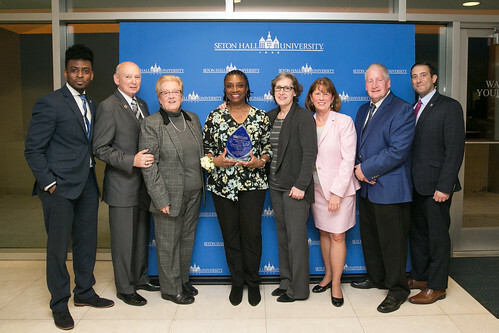 Thank you for supporting the College of Education and Human Services at Seton Hall at the 6th Annual Spring Alumni Reception. Here is an opportunity to make a gift to the Gerard Babo Memorial Fund. The Babo family and the College of Education and Human Services have established a fund in Gerald Babo's memory in order to perpetuate his work with students and to pay honor to his incredible dedication. Gerry's accomplishments and commitment to those he taught and with whom he worked is legendary. This fund is being set up to provide financial support for graduate students in Gerry’s department – the Department of Education Leadership, Management and Policy. It will also provide an award to be presented at Commencement. Below are pictures from the event. We look forward to seeing you soon. Erika Klinger, M.A. '11, Director of Campus Partnerships, Alumni Relations at erika.klinger@shu.edu or (973) 378-9827.